In May 2012, the human remains of 12 individuals (men, women, and children) were discovered in an underground cavity of the Ukrainian Church in our town of Rohatyn. A medical examination determined they were complete, and likely at least 50 years old. This Church during the War bordered the Jewish ghetto, and there have long been stories of Jewish families that hid in these underground bunkers and tunnels. 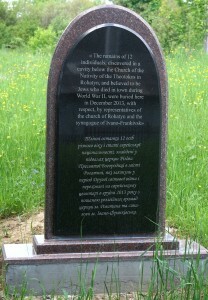 Three years later, and thanks to the efforts of Rohatyn group descendants, researcher and friend Alex Den (Alex Denysenko), and local retired teacher and Ukrainian historian Mr. Vorobets, in cooperation with the Priest of Rohatyn’s Ukrainian Church, these remains today have a memorial to the memory of these 12 individuals – likely Jewish – in the “new” Jewish cemetery in Rohatyn. Last year, with the assistance and participation of Rabbi Kolesnik of Ivano-Frankivsk, the bones were laid in the ground of the cemetery in a discreet ceremony attended by a handful, including a representative of the Church, the Rabbi, Mr. Vorobets, and Alex Den. Memorial over the remains in the new Jewish cemetery of Rohatyn. Photo © 2015 Alex Denysenko. A closeup of the memorial stone. Photo © 2015 Alex Denysenko. 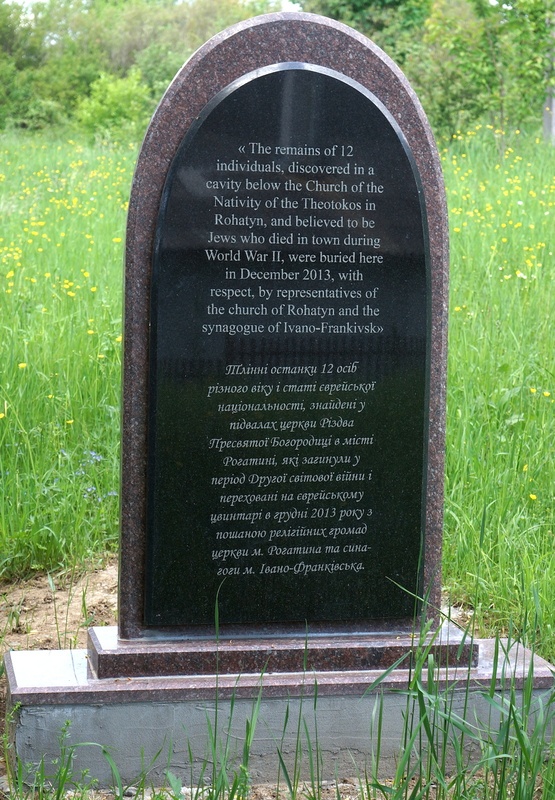 The remains of 12 individuals, discovered in a cavity below the Church of the Nativity of the Theotokos in Rohatyn, and believed to be Jews who died in town during World War II, were buried here in December 2013, with respect, by representatives of the church of Rohatyn and the synagogue of Ivano-Frankivsk.